We are more than excited to debut the new 2018 Glowgear Gen2 wireless interactive targets at Horton Park Golf Course in Epsom England. It took only two days to install 9 new fully interactive field targets that respond with light and sound when hit with a golf balls. “We see these targets as the first phase of our facility moving into both day and evening golf entertainment”, says owner Richard Haygarth. Each target is made of an optical vinyl made to withstand weather and golf ball impacts. 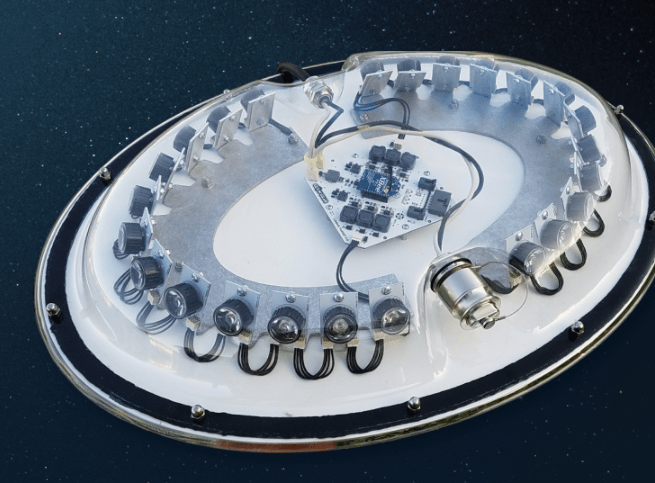 Inside each target is a powerful 24 Watt Smart light with computer set up on a mesh network so all targets communicate with one another. Each target is controlled from the clubhouse so the head pro can change each targets light response and sound with a simply click of the mouse. INCREASE DAY AND EVENING ATTENDANCE: During the day the pro can now turn on new golfers, juniors and even serious golfers by teaching with the driving range targets and allowing players to actually go for something on the field that gives them feedback. Then at night, the pro can change the daytime sound to night time party sounds that make people laugh when they hit targets. It’s like being inside a giant pinball machine. FAST INSTALLATION – HOW WAS THIS POSSIBLE: It took three years of hard development by Glowgear to pioneer and streamline a field target that consists of the driving range target, target light and lithium power pack. That’s it. Now venues can install field targets without running underground power lines or communication or permits. Just connect targets to the ground, place light and power pack inside and start playing. It’s that easy. Here are some photos taken during installation. By this weekend the targets will have numbers on them. We look forward to showing even better pictures of the launch party this weekend.